Looking for easy leftover Girl Scout cookie recipes? 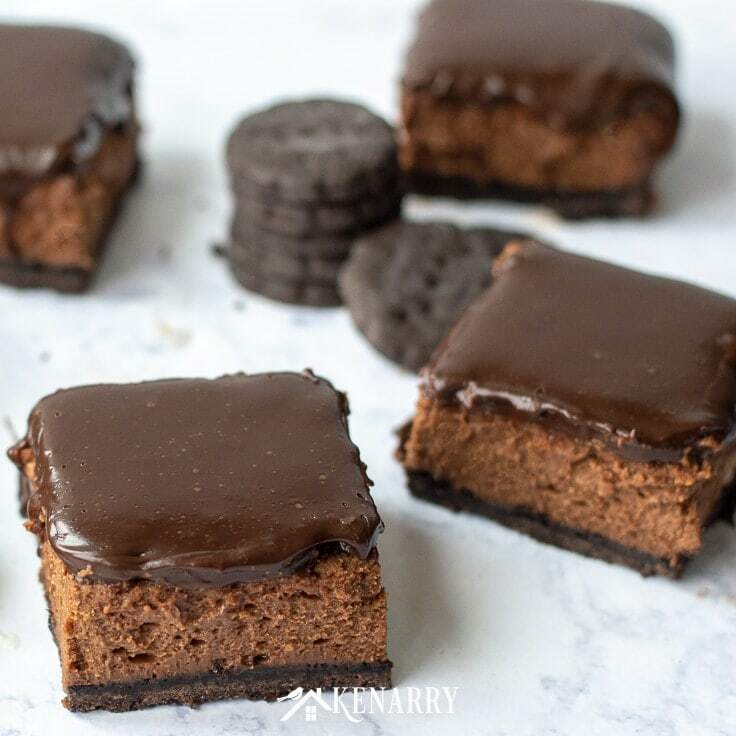 These delicious Chocolate Cheesecake Thin Mint Dessert Bars are exactly the sweet treat you need! It’s that time of year when Girl Scouts are going door-to-door or setting up store front booths to sell their irresistible cookies. 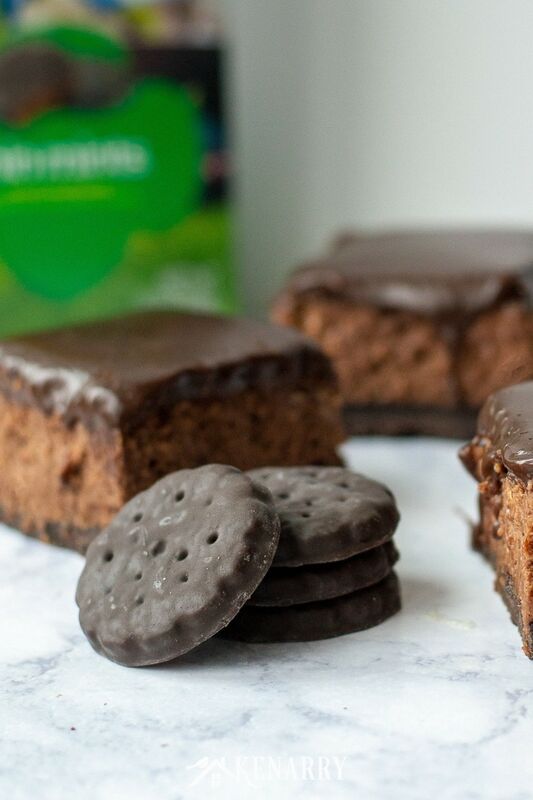 If you can’t pass by their table without buying a dozen boxes, chances are you need some great leftover Girl Scout Cookie recipes. 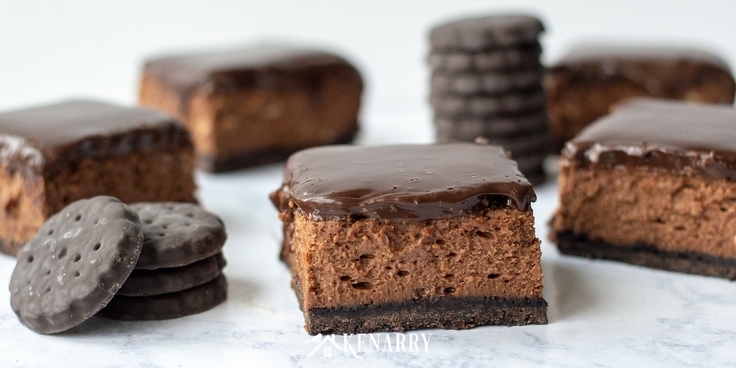 Today we’re sharing how to make decadent and easy chocolate cheesecake to serve as delicious Thin Mint dessert bars. Popular signs of spring include the return of chirping robins, leaves sprouting on trees in the yard and effervescent Girl Scouts selling cookies outside of our favorite stores. I mean, seriously who can resist their cheerful little faces and those tempting boxes of Girl Scout cookies? After all, it’s for a good cause, am I right? Thin Mints are one of my all-time favorite Girl Scout cookies (next to the Samoas). So you can imagine how thrilled I was when Meaghan Lamm from Cook. Craft. Love. 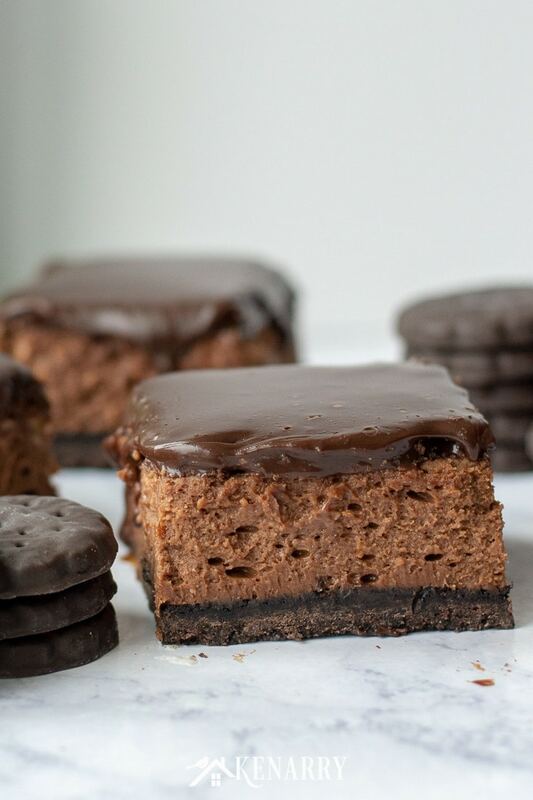 brought over her amazing recipe for Chocolate Cheesecake Bars made from Thin Mints. Meaghan is so creative when it comes to mint desserts. 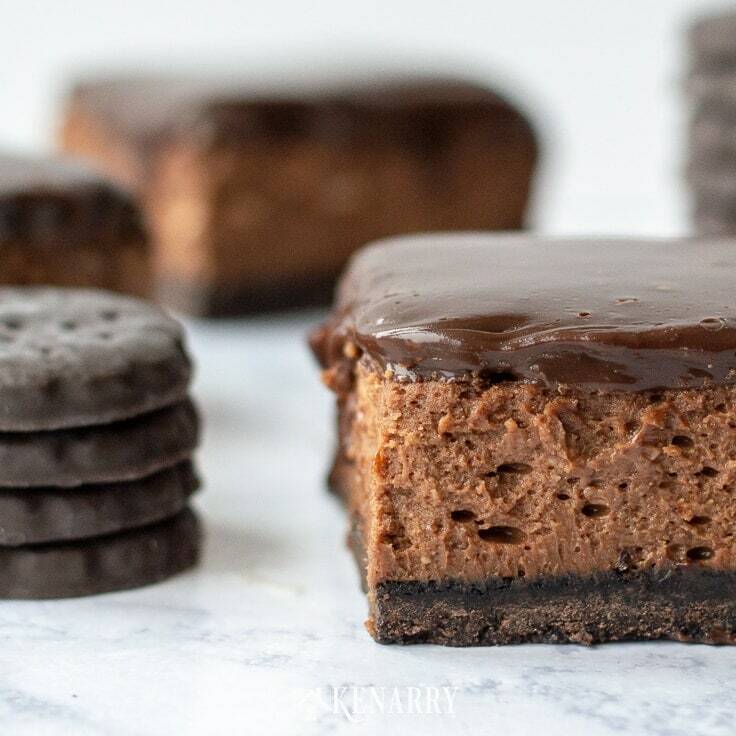 She actually based this leftover Girl Scout cookie recipe on her Mint Oreo Cheesecake Bars. But if you LOVE all things mint, she also has great recipes for homemade Mint Chocolate Chip Ice Cream, Pineapple Mint Mango Mojito and Peppermint Chocolate Mug Cake For Two that you ought to try! Before you get started, preheat your oven to 425 degrees. Get out an 8×8 pan and line it with parchment paper. Then set the pan aside. 2. Make the crust using leftover Girl Scout cookies. In a food processor, crush the Thin Mints until there’s nothing left but tiny crumbs. You don’t want any large chunks of cookie to remain. If you don’t have a food processor, you could use blender for this step. Or you could even put the Thin Mint cookies in a large resealable bag and crush them with a rolling pin or kitchen mallet. Once the Thin Mint cookies are crushed, add the melted butter. Pulse the food processor or blender until the mixture resembles coarse crumbs. 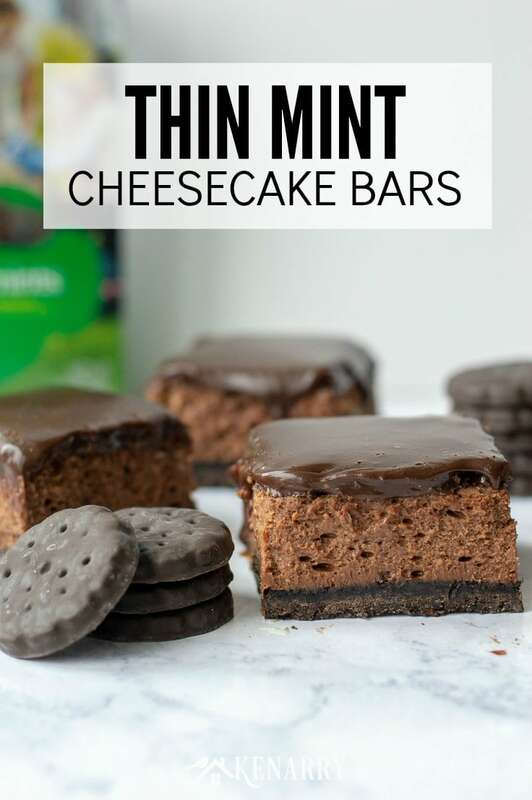 Now using your hands or the back of a measuring cup press the Thin Mint crumbs into the prepared 8×8 baking tin in an even layer and set it aside. 3. Mix the cream cheese layer. Now add the eggs and vanilla and continue to beat well. Next melt the chocolate chips in a microwave safe bowl. The best way to melt the chocolate is to do this in 15 second increments, stirring after each one, until it’s completely melted. Then, with your mixer on low, drizzle the melted chocolate into the cream cheese mixture. Continue to mix the cheesecake batter until it’s well combined. Lastly, scrape down the side of the bowl with a spatula to make sure the chocolate is completely incorporated. Then pour the chocolate cheesecake batter over your prepared Thin Mint crust. Use the spatula to carefully smooth the cheesecake batter into the corners. 4. 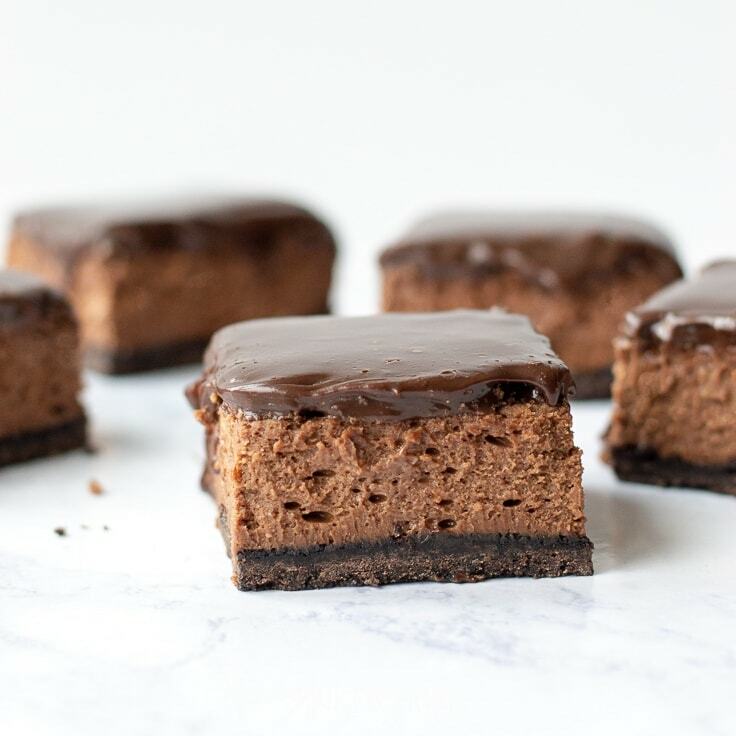 Bake the Chocolate Cheesecake Bars. After 15 minutes, turn the oven off completely. Now you should crack the oven door open, but leave the cheesecake in the oven to cool for an additional 30 minutes. This will help prevent the chocolate cheesecake from cracking. 5. Make the homemade ganache. While the cheesecake is cooling in the oven, it’s time to make the ganache. Start by heating heavy cream in a microwave safe bowl until it’s hot and just bubbles around the edges. Be very careful not to let it boil. Once the heavy cream is hot, add the dark chocolate chips. Cover the bowl with a plate or plastic wrap, and let it sit for 5 minutes. Pour ganache over the cooled cheesecake and spread it into an even layer. 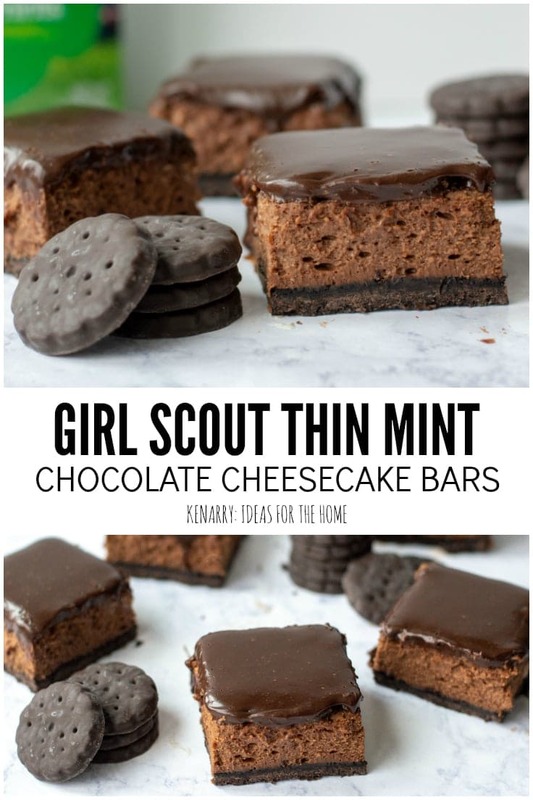 Refrigerate the Thin Mint dessert bars for at least 4 hours or even overnight. 6. 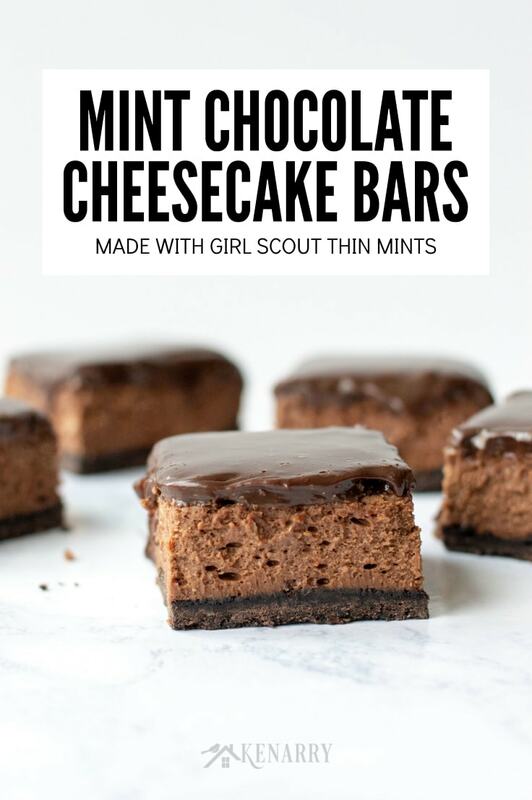 Serve and enjoy the Thin Mint dessert bars! Once the dessert has cooled in the refrigerator for the allotted amount of time, you’re ready to cut them into bars. Serve your Thin Mint dessert bars with a tall glass of milk or a warm cup of coffee — and enjoy! Preheat oven to 425 degrees and line an 8×8 pan with parchment paper and set aside. 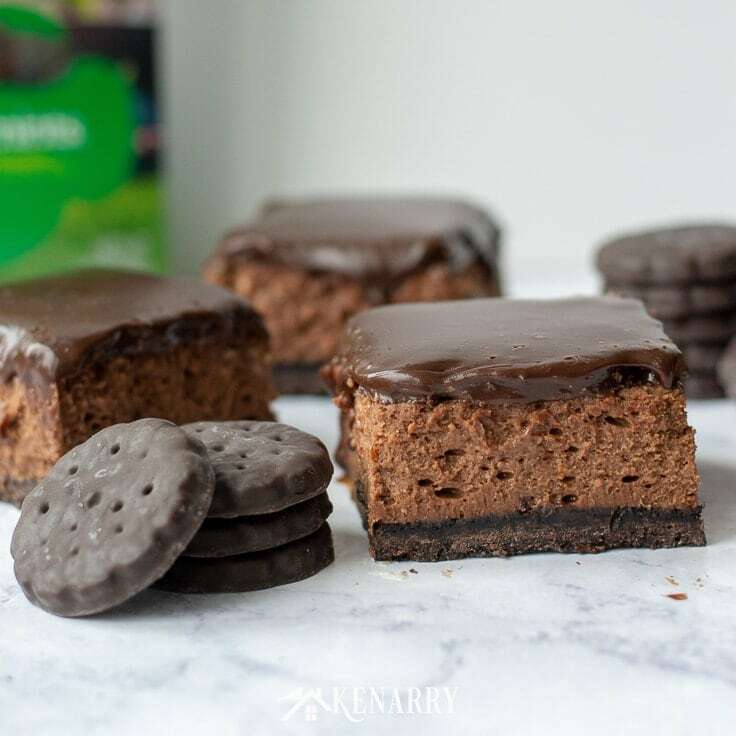 In a food processor, process the Thin Mints until no large chunks remain. Add melted butter and pulse until mixture resembles coarse crumbs. Using your hands or the back of a measuring cup press crumbs into the prepared baking tin in an even layer and set aside. In a stand mixer fitted with a whisk attachment, beat cream cheese until creamy and smooth. Then add sugar, flour, and pinch of salt and mix well. Melt chocolate chips in a microwave safe bowl in 15 second increments, stirring after each one, until completely melted. Then, with the mixer on low, drizzle melted chocolate into the cream cheese mixture and mix until well combined. Scrape down bowl, making sure the chocolate is completely incorporated, and pour over your prepared crust, smoothing it into the corners. Bake at 425 degrees for 10 minutes, then reduce the oven temperature to 350 degrees (DO NOT OPEN DOOR) and bake for another 15 minutes. After 15 minutes, turn the oven off, crack the door, and leave to cool for 30 minutes. This will help prevent cracking. 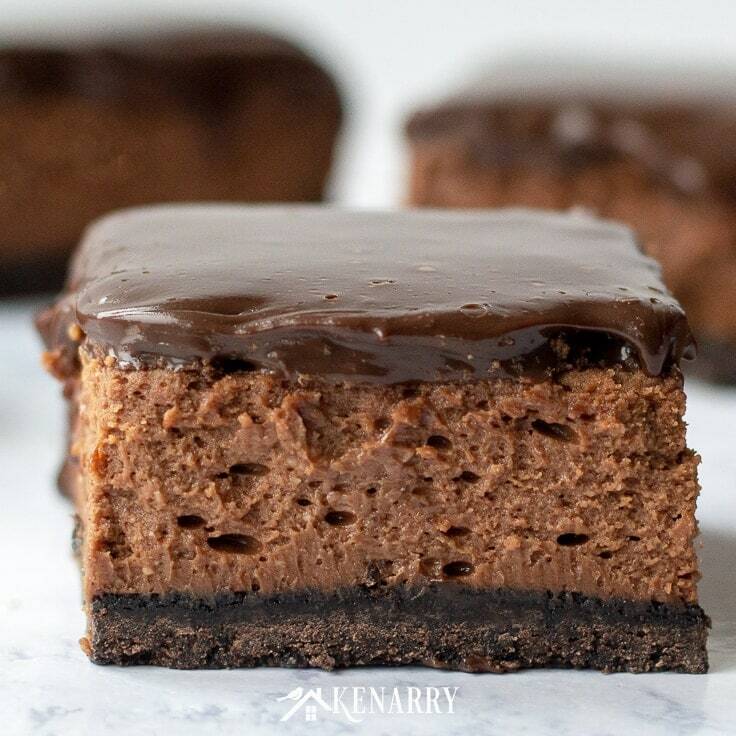 While the cheesecake is cooling, make the ganache by heating heavy cream in a microwave safe bowl until its hot and just bubbles around the edges (be careful not to let it boil). Once hot, add the chocolate chips, cover with a plate or plastic wrap, and let it sit for 5 minutes. After 5 minutes, stir it constantly until all the chocolate is melted and the mixture thickens. Pour ganache over the cooled cheesecake, spreading into an even layer and refrigerate 4 hours or overnight. Now that you’ve made these Thin Mint Chocolate Cheesecake bars, would you say that it’s one of the most delicious leftover Girl Scout cookie recipes you’ve ever tried? Comment below and tell us some of the other ways you love to use leftover Girl Scout cookies. We’re always looking for new ideas!